05/14/2012 9:29 AM - LOVES PARK, Ill. - Mrs. Illinois Lisa Sonnenberg will help mark the start of a new season for the Rockford RiverHawks by throwing out the ceremonial first pitch May 25 at RiverHawks Stadium. 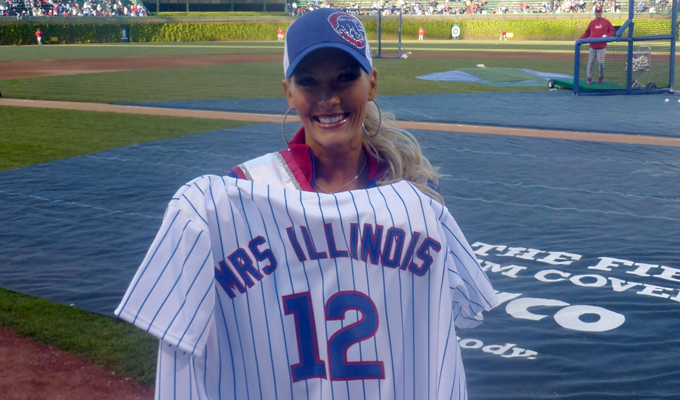 Mrs. Illinois is familiar with the pregame ritual as she threw the first pitch at Wrigley Field before the Cubs vs Cardinals game April 23. She has also appeared at many other sporting events in the state, including Bulls' and Blackhawks' games. Following the start of the game, Mrs. Illinois will be available to take pictures and sign autographs for fans. An active fitness buff, Mrs. Illinois recently competed in the OCB Midwest States Fitness/Figure Competition in November and took first place in her division. As someone who has battled postpartum depression, Mrs. Illinois continues to make appearances and discuss her platform of depression awareness and mental health, hoping to be a voice for other women suffering through it. The RiverHawks are members of the Frontier League, an independent professional baseball league that will play its 20th season in 2012. The RiverHawks open their 11th season on May 18 at River City. The home opener is scheduled for 7:05 p.m. May 25 against Lake Erie. Advertising and season-ticket information is available by calling (815) 885-2255. Fans can also visit www.rockfordriverhawks.com.